Audrey J. Weiss, Ph.D., and Kevin C. Heslin, Ph.D. This Healthcare Cost and Utilization Project (HCUP) Statistical Brief is the fourth report in AHRQ's series on opioid-related hospital use by State. It presents statistics based on HCUP Fast Stats on the primary expected payer of opioid-related hospital inpatient stays and ED visits in fiscal year (FY) 2010 (from quarter 4 of 2009 through quarter 3 of 2010) and FY 2015 (from quarter 4 of 2014 through quarter 3 of 2015), hereinafter referred to as 2010 and 2015 in this Statistical Brief.5,6 The percentage of opioid-related inpatient stays are presented by payer for each of the 42 States that provided inpatient data in 2010 and 2015. The percentage of opioid-related ED visits are presented by payer for each of the 23 States that provided ED visit data in 2010 and 2015. Identification of opioid-related stays and ED visits is based on all-listed diagnoses and includes events associated with prescription opioids or illicit opioids such as heroin. Figure 1 presents the national distribution of opioid-related inpatient stays and emergency department (ED) visits by expected primary payer in 2010 and 2015. Nationally, from 2010 to 2015, the share of opioid-related inpatient stays and emergency department (ED) visits shifted away from private payers and no insurance and toward public payers (Medicare and Medicaid). 34 of 42 States had a decrease in the share of uninsured opioid-related stays of 10 percent or more. 18 of 23 States had a decrease in the share of uninsured opioid-related ED visits of 10 percent or more. a Opioid-related stays for which the expected payer was Other, missing, or invalid were excluded. The share of opioid-related hospital stays or ED visits was calculated based on only those records for which the expected payer was Medicare, Medicaid, private insurance, or uninsured; thus, the total is equal to 100 percent. 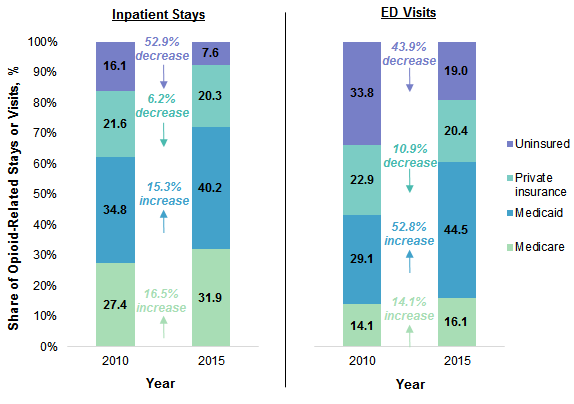 Share of opioid-related inpatient stays and ED visits by payer, 2010 and 2015 Stacked bar chart that shows the share of opioid inpatient stays or emergency department visits by payer in 2010 and 2015. Inpatient stays: Uninsured: 2010, 16.1; 2015, 7.6—cumulative decrease of 52.9%. Private insurance: 2010, 21.6; 2015, 20.3—cumulative decrease of 6.2%. Medicaid: 2010, 34.8; 2015, 40.2—cumulative increase of 15.3%. Medicare: 2010, 27.4; 2015, 31.9—cumulative increase of 16.5%. ED visits: Uninsured: 2010, 33.8; 2015, 19.0—cumulative decrease of 43.9%. Private insurance: 2010, 22.9; 2015, 20.4—cumulative decrease of 10.9%. Medicaid: 2010, 29.1; 2015, 44.5—cumulative increase of 52.8%. Medicare: 2010, 14.1; 2015, 16.1—cumulative increase of 14.1%. From 2010 to 2015, the share of opioid-related inpatient stays and ED visits with Medicare or Medicaid increased while the share with private insurance or uninsured decreased. From 2010 to 2015, the share of opioid-related stays increased 16.5 percent for Medicare, from 27.4 to 31.9 percent of all opioid-related stays, and increased 15.3 percent for Medicaid, from 34.8 to 40.2 percent of all opioid-related stays. Concurrently, the share of opioid-related stays decreased 6.2 percent for private insurance, from 21.6 to 20.3 percent of all opioid-related stays, and decreased 52.9 percent for the uninsured, from 16.1 to 7.6 percent of all opioid-related stays. Similarly, over the same 5-year period, the share of opioid-related ED visits increased 14.1 percent for Medicare, from 14.1 to 16.1 percent of all opioid-related ED visits, and increased 52.8 percent for Medicaid, from 29.1 to 44.5 percent of all opioid-related ED visits. The share of opioid-related ED visits decreased 10.9 percent for private insurance, from 22.9 to 20.4 percent of all opioid-related ED visits, and decreased 43.9 percent for the uninsured, from 33.8 to 19.0 percent of all opioid-related ED visits. In the remainder of this Statistical Brief, the share of opioid-related inpatient stays and ED visits are presented by expected primary payer for each State that provided data in both 2010 and 2015. Figures 2-5 present the percentage of opioid-related stays for 42 States in 2010 and 2015 with an expected primary payer of Medicare (Figure 2), Medicaid (Figure 3), private insurance (Figure 4), and uninsured (Figure 5). For each State, the percentage of stays in 2010 is shown in the left column and is represented by the thin blue line; the percentage of stays in 2015 is shown in the right column and is represented by the wide green line. 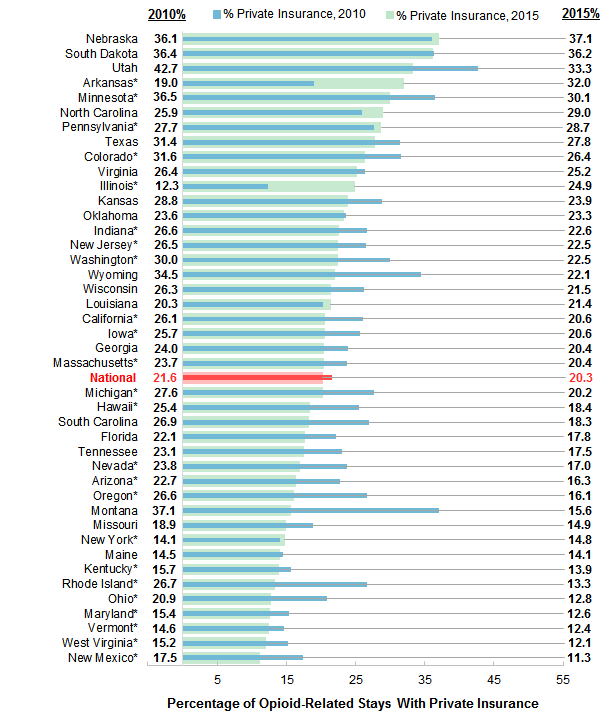 The percentage of opioid-related stays nationally (encompassing all States that contributed data to HCUP in 2010 or 2015) is provided for comparison. Appendix A lists the percentage change in share of opioid-related inpatient stays by payer between 2010 and 2015 for each State. Figure 2 presents the percentage of opioid-related inpatient stays with Medicare as the expected primary payer among the 42 States that provided data in 2010 and 2015. States are ordered according to their percentage of opioid-related stays with Medicare in 2015. Note: An asterisk denotes States that expanded Medicaid prior to fiscal year 2015, with the exception of Indiana, which expanded Medicaid on February 1, 2015, and Pennsylvania, which expanded Medicaid on January 1, 2015. Bar chart that shows the percentage of opioid-related inpatient stays with Medicare by State for 2010 and 2015. Data are provided in Supplementary Table 1. The share of opioid-related inpatient stays with Medicare in 2015 ranged from 50.2 percent to 19.9 percent across 42 States. In 2015, the highest share of opioid-related stays with Medicare was in Iowa (50.2 percent), followed by Nebraska (46.4 percent), Oregon (45.6 percent), Montana (45.5 percent), and Kansas (43.9 percent). The lowest share of opioid-related stays with Medicare was in New York (19.9 percent), followed by West Virginia (22.3 percent), New Jersey (22.4 percent), Illinois (23.5 percent), and Ohio (23.5 percent). Nationally, in 2015, the share of opioid-related stays with Medicare was 31.9 percent. Nearly all of the 42 States had either an increase or minimal change from 2010 to 2015 in the share of opioid-related stays with Medicare. From 2010 to 2015, 19 of 42 States had an increase of 10 percent or more in the share of opioid-related stays with Medicare. Wyoming had the largest increase in share (49.5 percent), increasing from 26.1 to 39.1 percent of opioid-related stays with Medicare. New York and Washington had the next largest increases in share of opioid-related stays with Medicare (34.5 and 32.2 percent increases, respectively). Only one State had a decrease of 10 percent or more in the share of opioid-related stays with Medicare from 2010 to 2015. West Virginia had a 12.3 percent decrease in share, decreasing from 25.4 to 22.3 percent of opioid-related stays with Medicare. The remaining 22 of 42 States had a change of less than 10 percent in the share of opioid-related stays with Medicare from 2010 to 2015, ranging from a 9.4 percent increase in share in Kentucky to a 9.5 percent decrease in share in Arkansas. Appendix A lists the percentage change in share of opioid-related inpatient stays with Medicare between 2010 and 2015 for each State. Figure 3 presents the percentage of opioid-related inpatient stays with Medicaid as the expected primary payer among the 42 States that provided data in 2010 and 2015. States are ordered according to their percentage of opioid-related stays with Medicaid in 2015. 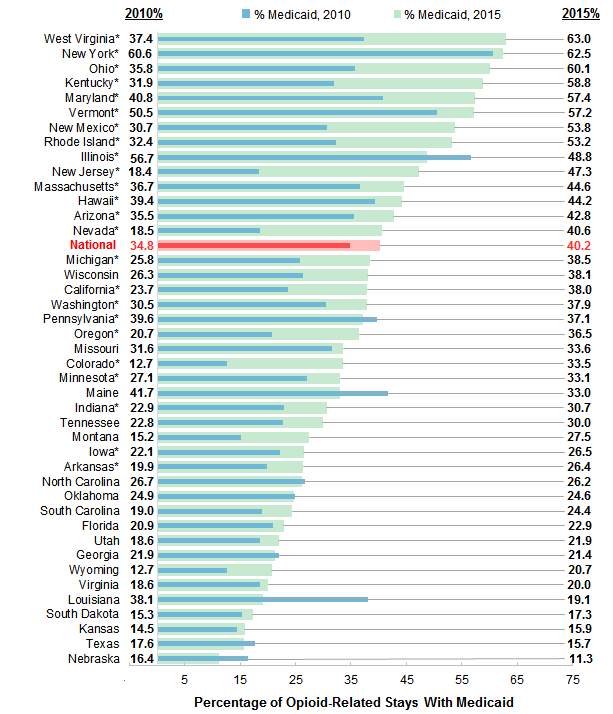 Bar chart that shows the percentage of opioid-related inpatient stays with Medicaid by State for 2010 and 2015. Data are provided in Supplementary Table 1. The share of opioid-related inpatient stays with Medicaid in 2015 ranged from 63.0 percent to 11.3 percent across 42 States. In 2015, the highest share of opioid-related stays with Medicaid was in West Virginia (63.0 percent), followed by New York (62.5 percent), Ohio (60.1 percent), Kentucky (58.8 percent), and Maryland (57.4 percent). The lowest share of opioid-related stays with Medicaid was in Nebraska (11.3 percent), followed by Texas (15.7 percent), Kansas (15.9 percent), South Dakota (17.3 percent), and Louisiana (19.1 percent). Nationally, in 2015, the share of opioid-related stays with Medicaid was 40.2 percent. The majority of 42 States had an increase from 2010 to 2015 in the share of opioid-related stays with Medicaid. From 2010 to 2015, 28 of 42 States had an increase of 10 percent or more in the share of opioid-related stays with Medicaid. Colorado had the largest increase in share (163.6 percent), increasing from 12.7 to 33.5 percent of opioid-related stays with Medicaid. New Jersey and Nevada had the next largest increases in share of opioid-related stays with Medicaid (157.5 and 119.4 percent increases, respectively). A total of 5 of 42 States had a decrease of 10 percent or more in the share of opioid-related stays with Medicaid from 2010 to 2015. Louisiana had the largest decrease in share (50.0 percent), decreasing from 38.1 to 19.1 percent of opioid-related stays with Medicaid. Nebraska and Maine had the next largest decreases in share of opioid-related stays with Medicaid (31.1 and 20.9 percent decreases, respectively). The remaining 9 of 42 States had a change of less than 10 percent in the share of opioid-related stays with Medicaid from 2010 to 2015, ranging from a 9.4 percent increase in share in Florida to a 6.4 percent decrease in share in Pennsylvania. Appendix A lists the percentage change in share of opioid-related inpatient stays with Medicaid between 2010 and 2015 for each State. Figure 4 presents the percentage of opioid-related inpatient stays with private insurance as the expected primary payer among the 42 States that provided data in 2010 and 2015. States are ordered according to their percentage of opioid-related stays with private insurance in 2015. Bar chart that shows the percentage of opioid-related inpatient stays with private insurance by State for 2010 and 2015. Data are provided in Supplementary Table 1. The share of opioid-related inpatient stays with private insurance in 2015 ranged from 37.1 percent to 11.3 percent across 42 States. In 2015, the highest share of opioid-related stays with private insurance was in Nebraska (37.1 percent), followed by South Dakota (36.2 percent), Utah (33.3 percent), Arkansas (32.0 percent), and Minnesota (30.1 percent). The lowest share of opioid-related stays with private insurance was in New Mexico (11.3 percent), followed by West Virginia (12.1 percent), Vermont (12.4 percent), Maryland (12.6 percent), and Ohio (12.8 percent). Nationally, in 2015, the share of opioid-related stays with private insurance was 20.3 percent. The majority of 42 States had a decrease from 2010 to 2015 in the share of opioid-related stays with private insurance. From 2010 to 2015, 31 of 42 States had a decrease of 10 percent or more in the share of opioid-related stays with private insurance. Montana had the largest decrease in share (57.9 percent), decreasing from 37.1 to 15.6 percent of opioid-related stays with private insurance. Rhode Island and Oregon had the next largest decreases in share of opioid-related stays with private insurance (50.1 and 39.6 percent decreases, respectively). Only three States had an increase of 10 percent or more in the share of opioid-related stays with private insurance from 2010 to 2015. Illinois had a 102.4 percent increase in share, increasing from 12.3 to 24.9 percent of opioid-related stays with private insurance. Arkansas and North Carolina also had notable increases in share of opioid-related stays with private insurance (67.9 and 11.9 percent increases, respectively). The remaining 8 of 42 States had a change of less than 10 percent in the share of opioid-related stays with private insurance from 2010 to 2015, ranging from a 5.6 percent increase in share in Louisiana to a 4.6 percent decrease in share in Virginia. Appendix A lists the percentage change in share of opioid-related inpatient stays with private insurance between 2010 and 2015 for each State. Figure 5 presents the percentage of opioid-related inpatient stays that were uninsured among the 42 States that provided data in 2010 and 2015. States are ordered according to their percentage of opioid-related stays that were uninsured in 2015. Bar chart that shows the percentage of opioid-related inpatient stays that were uninsured by State for 2010 and 2015. Data are provided in Supplementary Table 1. The share of opioid-related inpatient stays that were uninsured in 2015 ranged from 35.9 percent to 1.3 percent across 42 States. In 2015, the highest share of opioid-related stays that were uninsured was in Louisiana (35.9 percent), followed by Texas (22.1 percent), Virginia (21.4 percent), Missouri (21.3 percent), and South Carolina (21.1 percent). The lowest share of opioid-related stays that were uninsured was in Minnesota (1.3 percent), followed by Michigan (1.5 percent), Massachusetts (1.6 percent), Rhode Island (1.8 percent), and Oregon (1.8 percent). Nationally, in 2015, the share of opioid-related stays that were uninsured was 7.6 percent. The majority of 42 States had a decrease from 2010 to 2015 in the share of opioid-related stays that were uninsured. From 2010 to 2015, 34 of 42 States had a decrease of 10 percent or more in the share of opioid-related stays that were uninsured. Kentucky had the largest decrease in share (89.5 percent), decreasing from 30.4 to 3.2 percent of opioid-related stays that were uninsured. Oregon and West Virginia had the next largest decreases in share of opioid-related stays that were uninsured (88.2 and 88.1 percent decreases, respectively). Only three States had an increase of 10 percent or more in the share of opioid-related stays that were uninsured from 2010 to 2015. Louisiana had a 90.5 percent increase in share, increasing from 18.8 to 35.9 percent of opioid-related stays that were uninsured. Maine and Missouri also had notable increases in share of opioid-related stays that were uninsured (26.0 and 10.4 percent increases, respectively). The remaining 5 of 42 States had a change of less than 10 percent in the share of opioid-related stays that were uninsured from 2010 to 2015, ranging from a 6.4 percent increase in share in Virginia to a 7.1 percent decrease in share in North Carolina. Appendix A lists the percentage change in share of opioid-related inpatient stays that were uninsured between 2010 and 2015 for each State. Figures 6-9 present the share of opioid-related ED visits for 23 States in 2010 and 2015 with an expected primary payer of Medicare (Figure 6), Medicaid (Figure 7), private insurance (Figure 8), and uninsured (Figure 9). For each State, the percentage of visits in 2010 is shown in the left column and is represented by the thin blue line; the percentage of visits in 2015 is shown in the right column and is represented by the wide green line. The percentage of opioid-related ED visits nationally (encompassing all States that contributed data to HCUP in 2010 or 2015) is provided for comparison. Appendix B lists the percentage change in share of opioid-related ED visits by payer between 2010 and 2015 for each State. Figure 6 presents the percentage of opioid-related ED visits with Medicare as the expected primary payer among the 23 States that provided data in 2010 and 2015. States are ordered according to their percentage of opioid-related ED visits with Medicare in 2015. Note: An asterisk denotes States that expanded Medicaid prior to fiscal year 2015, with the exception of Indiana, which expanded Medicaid on February 1, 2015. 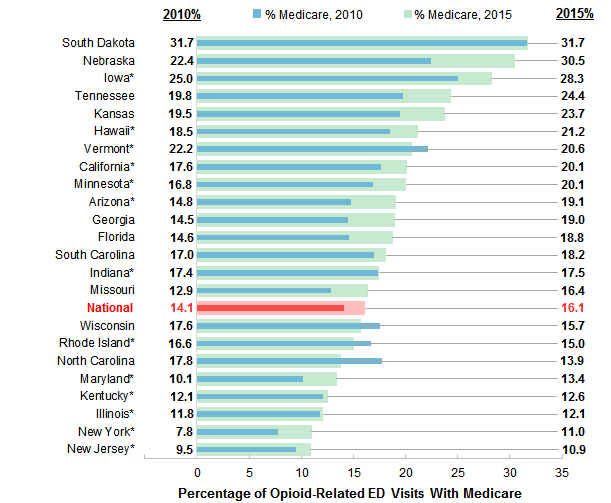 Bar chart that shows the percentage of opioid-related ED visits with Medicare by State for 2010 and 2015. Data are provided in Supplementary Table 2. The share of opioid-related ED visits with Medicare in 2015 ranged from 31.7 percent to 10.9 percent across 23 States. In 2015, the highest share of opioid-related ED visits with Medicare was in South Dakota (31.7 percent), followed by Nebraska (30.5 percent), Iowa (28.3 percent), Tennessee (24.4 percent), and Kansas (23.7 percent). The lowest share of opioid-related ED visits with Medicare was in New Jersey (10.9 percent), followed by New York (11.0 percent), Illinois (12.1 percent), Kentucky (12.6 percent), and Maryland (13.4 percent). Nationally, in 2015, the share of opioid-related ED visits with Medicare was 16.1 percent. Nearly all of the 23 States had either an increase or minimal change from 2010 to 2015 in the share of opioid-related ED visits with Medicare. From 2010 to 2015, 14 of 23 States had an increase of 10 percent or more in the share of opioid-related ED visits with Medicare. New York had the largest increase in share (41.6 percent), increasing from 7.8 to 11.0 percent of opioid-related ED visits with Medicare. Nebraska and Maryland had the next largest increases in share of opioid-related ED visits with Medicare (36.0 and 32.3 percent increases, respectively). Only two States had a decrease of 10 percent or more in the share of opioid-related ED visits with Medicare from 2010 to 2015. North Carolina had a 22.0 percent decrease in share, decreasing from 17.8 to 13.9 percent of opioid-related ED visits with Medicare. Wisconsin also had a notable decrease in share of opioid-related ED visits with Medicare (10.6 percent). The remaining 7 of 23 States had a change of less than 10 percent in the share of opioid-related ED visits with Medicare from 2010 to 2015, ranging from a 6.8 percent increase in share in South Carolina to a 9.8 percent decrease in share in Rhode Island. Appendix B lists the percentage change in share of opioid-related ED visits with Medicare between 2010 and 2015 for each State. Figure 7 presents the percentage of opioid-related ED visits with Medicaid as the expected primary payer among the 23 States that provided data in 2010 and 2015. States are ordered according to their percentage of opioid-related ED visits with Medicaid in 2015. Bar chart that shows the percentage of opioid-related ED visits with Medicaid by State for 2010 and 2015. Data are provided in Supplementary Table 2. The share of opioid-related ED visits with Medicaid in 2015 ranged from 59.9 percent to 10.1 percent across 23 States. 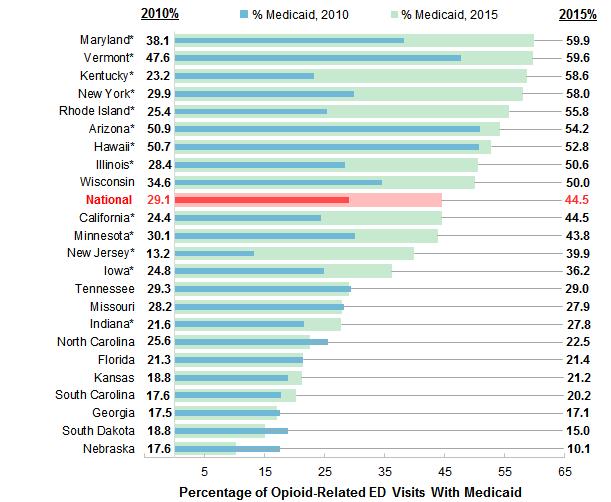 In 2015, the highest share of opioid-related ED visits with Medicaid was in Maryland (59.9 percent), followed by Vermont (59.6 percent), Kentucky (58.6 percent), New York (58.0 percent), and Rhode Island (55.8 percent). The lowest share of opioid-related ED visits with Medicaid was in Nebraska (10.1 percent), followed by South Dakota (15.0 percent), Georgia (17.1 percent), South Carolina (20.2 percent), and Kansas (21.2 percent). Nationally, in 2015, the share of opioid-related ED visits with Medicaid was 44.5 percent. Nearly all of the 23 States had either an increase or minimal change from 2010 to 2015 in the share of opioid-related ED visits with Medicaid. From 2010 to 2015, 14 of 23 States had an increase of 10 percent or more in the share of opioid-related ED visits with Medicaid. New Jersey had the largest increase in share (201.7 percent), increasing from 13.2 to 39.9 percent of opioid-related ED visits with Medicaid. Kentucky and Rhode Island had the next largest increases in share of opioid-related ED visits with Medicaid (152.9 and 119.4 percent increases, respectively). Only three States had a decrease of 10 percent or more in the share of opioid-related ED visits with Medicaid from 2010 to 2015. Nebraska had a 42.4 percent decrease in share, decreasing from 17.6 to 10.1 percent of opioid-related ED visits with Medicaid. South Dakota and North Carolina also had notable decreases in share of opioid-related ED visits with Medicaid (20.3 and 11.8 percent decreases, respectively). The remaining 6 of 23 States had a change of less than 10 percent in the share of opioid-related ED visits with Medicaid from 2010 to 2015, ranging from a 6.5 percent increase in share in Arizona to a 2.3 percent decrease in share in Georgia. Appendix B lists the percentage change in share of opioid-related ED visits with Medicaid between 2010 and 2015 for each State. Figure 8 presents the percentage of opioid-related ED visits with private insurance as the expected primary payer among the 23 States that provided data in 2010 and 2015. States are ordered according to their percentage of opioid-related ED visits with private insurance in 2015. 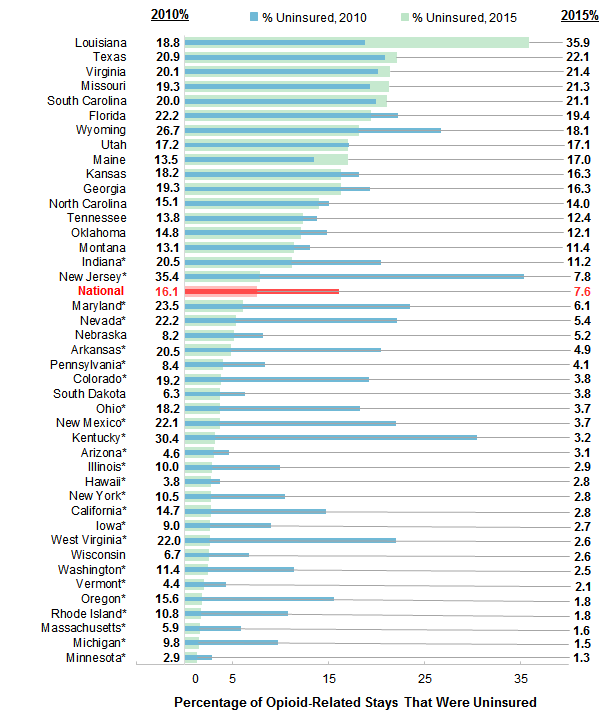 Bar chart that shows the percentage of opioid-related ED visits with private insurance by State for 2010 and 2015. Data are provided in Supplementary Table 2. The share of opioid-related ED visits with private insurance in 2015 ranged from 48.8 percent to 12.2 percent across 23 States. In 2015, the highest share of opioid-related ED visits with private insurance was in Nebraska (48.8 percent), followed by South Dakota (38.7 percent), Minnesota (30.4 percent), New Jersey (28.3 percent), and Indiana (27.7 percent). The lowest share of opioid-related ED visits with private insurance was in Vermont (12.2 percent), followed by Maryland (15.0 percent), New York (15.7 percent), Tennessee (15.8 percent), and Arizona (16.4 percent). Nationally, in 2015, the share of opioid-related ED visits with private insurance was 20.4 percent. The majority of 23 States had either a decrease or minimal change from 2010 to 2015 in the share of opioid-related ED visits with private insurance. From 2010 to 2015, 9 of 23 States had a decrease of 10 percent or more in the share of opioid-related ED visits with private insurance. New York had the largest decrease in share (54.9 percent), decreasing from 34.8 to 15.7 percent of opioid-related ED visits with private insurance. 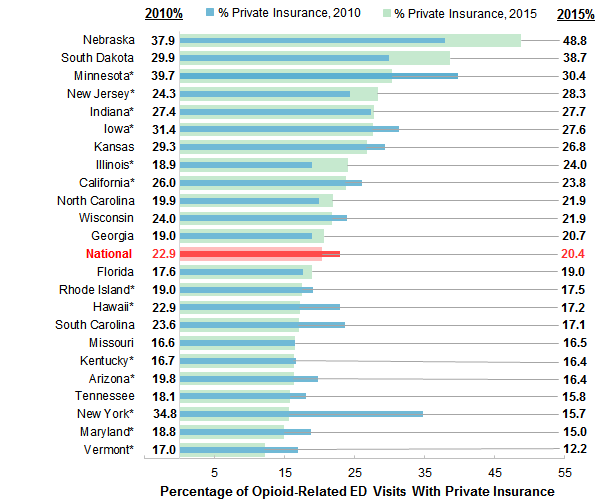 Vermont and South Carolina had the next largest decreases in share of opioid-related ED visits with private insurance (28.1 and 27.7 percent decreases, respectively). A total of 5 of 23 States had an increase of 10 percent or more in the share of opioid-related ED visits with private insurance from 2010 to 2015. South Dakota had a 29.5 percent increase in share, increasing from 29.9 to 38.7 percent of opioid-related ED visits with private insurance. Nebraska and Illinois had the next largest increases in share of opioid-related ED visits with private insurance (28.8 and 27.0 percent increases, respectively). The remaining 9 of 23 States had a change of less than 10 percent in the share of opioid-related ED visits with private insurance from 2010 to 2015, ranging from an 8.9 percent increase in share in Georgia to an 8.7 percent decrease in share in Wisconsin, Kansas, and California. Appendix B lists the percentage change in share of opioid-related ED visits with private insurance between 2010 and 2015 for each State. Figure 9 presents the percentage of opioid-related ED visits that were uninsured among the 23 States that provided data in 2010 and 2015. States are ordered according to their percentage of opioid-related ED visits that were uninsured in 2015. 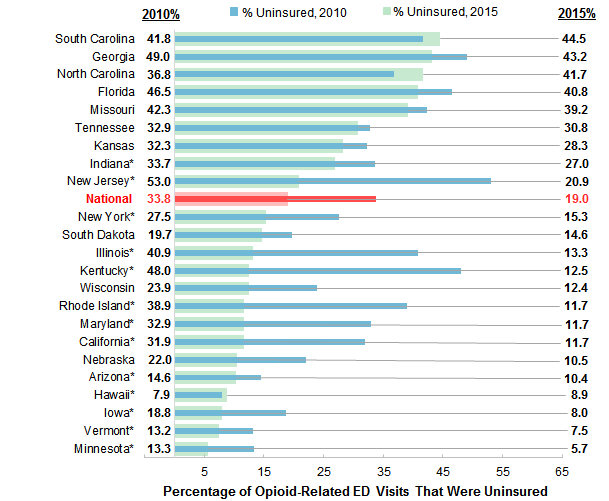 Bar chart that shows the percentage of opioid-related ED visits that were uninsured by State for 2010 and 2015. Data are provided in Supplementary Table 2. The share of opioid-related ED visits that were uninsured in 2015 ranged from 44.5 percent to 5.7 percent across 23 States. In 2015, the highest share of opioid-related ED visits that were uninsured was in South Carolina (44.5 percent), followed by Georgia (43.2 percent), North Carolina (41.7 percent), Florida (40.8 percent), and Missouri (39.2 percent). The lowest share of opioid-related ED visits that were uninsured was in Minnesota (5.7 percent), followed by Vermont (7.5 percent), Iowa (8.0 percent), Hawaii (8.9 percent), and Arizona (10.4 percent). Nationally, in 2015, the share of opioid-related ED visits that were uninsured was 19.0 percent. The majority of 23 States had a decrease from 2010 to 2015 in the share of opioid-related ED visits that were uninsured. From 2010 to 2015, 18 of 23 States had a decrease of 10 percent or more in the share of opioid-related ED visits that were uninsured. Kentucky had the largest decrease in share (74.1 percent), decreasing from 48.0 to 12.5 percent of opioid-related ED visits that were uninsured. Rhode Island and Illinois had the next largest decreases in share of opioid-related ED visits that were uninsured (69.9 and 67.6 percent decreases, respectively). Only two States had an increase of 10 percent or more in the share of opioid-related ED visits that were uninsured from 2010 to 2015. North Carolina had a 13.3 percent increase in share, increasing from 36.8 to 41.7 percent of opioid-related ED visits that were uninsured. Hawaii also had a notable increase in share of opioid-related ED visits that were uninsured (12.3 percent increase). The remaining three States had a change of less than 10 percent in the share of opioid-related ED visits that were uninsured from 2010 to 2015: a 6.7 percent increase in share in South Carolina, a 6.1 percent decrease in share in Tennessee, and a 7.5 percent decrease in share in Missouri. Appendix B lists the percentage change in share of opioid-related ED visits that were uninsured between 2010 and 2015 for each State. The estimates in this Statistical Brief are based upon data from the HCUP 2010 and 2015 National (Nationwide) Inpatient Sample (NIS), Nationwide Emergency Department Sample (NEDS), State Inpatient Databases (SID), and State Emergency Department Databases (SEDD). The statistics were based upon information from HCUP Fast Stats, a free, online tool that provides users with easy access to the latest HCUP-based statistics for health information topics, including opioid-related hospital use.7 Emergency department (ED) visits (State and national) are restricted to those ED visits that do not result in an admission to the same hospital. ED visits resulting in admission to the same hospital are included in the inpatient stay statistics. Inpatient statistics from HCUP Fast Stats were available for the following 42 States in 2010 and 2015: Arizona, Arkansas, California, Colorado, Florida, Georgia, Hawaii, Illinois, Indiana, Iowa, Kansas, Kentucky, Louisiana, Maine, Maryland, Massachusetts, Michigan, Minnesota, Missouri, Montana, Nebraska, Nevada, New Jersey, New Mexico, New York, North Carolina, Ohio, Oklahoma, Oregon, Pennsylvania, Rhode Island, South Carolina, South Dakota, Tennessee, Texas, Utah, Vermont, Virginia, Washington, West Virginia, Wisconsin, and Wyoming. ED statistics from HCUP Fast Stats were available for the following 23 States in 2010 and 2015: Arizona, California, Florida, Georgia, Hawaii, Illinois, Indiana, Iowa, Kansas, Kentucky, Maryland, Minnesota, Missouri, Nebraska, New Jersey, New York, North Carolina, Rhode Island, South Carolina, South Dakota, Tennessee, Vermont, and Wisconsin. These codes include opioid-related use stemming from illicit opioids such as heroin, illegal use of prescription opioids, and the use of opioids as prescribed. Each type of opioid use is important for understanding and addressing the opioid epidemic in the United States.8 Although there may be interest in examining how much each type of opioid use contributes to the overall opioid problem, many of the opioid-related codes under the ICD-9-CM clinical coding system do not allow heroin-related cases to be explicitly identified (e.g., in the 304.0x series, heroin is not distinguished from other opioids). In addition, the codes do not distinguish between illegal use of prescription drugs and their use as prescribed. The statistics for share of opioid-related inpatient stays and ED visits reported in this Statistical Brief are rounded to the nearest tenth. The statistics reported for the percentage change in share are calculated based on nonrounded share values. This analysis used State Emergency Department Databases (SEDD) limited to data from community hospitals with a hospital-owned ED. Community hospitals are defined as short-term, non-Federal, general, and other hospitals, excluding hospital units of other institutions (e.g., prisons). Community hospitals include specialty, pediatric, public, and academic medical hospitals. Excluded for this analysis are long-term care facilities such as rehabilitation, psychiatric, and alcoholism and chemical dependency hospitals. The unit of analysis for inpatient data is the hospital discharge (i.e., the hospital stay), not a person or patient. This means that a person who is admitted to the hospital multiple times in 1 year will be counted each time as a separate discharge from the hospital. Inpatient stays include those for patients admitted through the ED. Patients transferred between inpatient hospitals are counted only once. For this Statistical Brief, uninsured patients may also include those with an expected payer of Indian Health Services, county indigent, migrant health programs, Ryan White Act, Hill-Burton Free Care, or other State or local programs for the indigent when those programs are identifiable in the Partner-provided coding of expected payer. This reclassification of patients from the "Other" group to the "Uninsured" group is possible only for some States and not for national estimates. Opioid-related stays for which the expected payer was Other, missing, or invalid were excluded. The share of opioid-related hospital stays or ED visits was calculated based only on those records for which the expected payer was Medicare, Medicaid, private insurance, or uninsured; thus, the total is equal to 100 percent. When more than one payer is listed for a hospital discharge or ED visit, the first-listed payer is used. Agency for Healthcare Research and Quality. Overview of the State Inpatient Databases (SID). Healthcare Cost and Utilization Project (HCUP). Rockville, MD: Agency for Healthcare Research and Quality. Updated April 2017. www.hcup-us.ahrq.gov/sidoverview.jsp. Accessed January 18, 2018. Agency for Healthcare Research and Quality. Overview of the State Emergency Department Databases (SEDD). Healthcare Cost and Utilization Project (HCUP). Rockville, MD: Agency for Healthcare Research and Quality. Updated September 2017. www.hcup-us.ahrq.gov/seddoverview.jsp. Accessed January 18, 2018. Weiss AJ (IBM Watson Health), Heslin KC (AHRQ). Payers of Opioid-Related Inpatient Stays and Emergency Department Visits Nationally and by State, 2010 and 2015. HCUP Statistical Brief #239. May 2018. Agency for Healthcare Research and Quality, Rockville, MD. www.hcup-us.ahrq.gov/reports/statbriefs/sb239-Opioid-Payer-Hospital-Stays-ED-Visits-by-State.pdf. The authors would like to acknowledge the contributions of Brian Eppert of Coding Leap, LLC; Marguerite Barrett of M.L. Barrett, Inc.; and Molly Bailey, Lauren O'Malley, and Minya Sheng of IBM Watson Health. This Statistical Brief was posted online on May 30, 2018. 1 Weiss AJ, Elixhauser A, Barrett ML, Steiner CA, Bailey MK, O'Malley L. Opioid-Related Inpatient Stays and Emergency Department Visits by State, 2009-2014. HCUP Statistical Brief #219. December 2016. Agency for Healthcare Research and Quality, Rockville, MD. www.hcup-us.ahrq.gov/reports/statbriefs/sb219-Opioid-Hospital-Stays-ED-Visits-by-State.pdf. Accessed February 13, 2018. 3 Weiss AJ, Bailey MK, O'Malley L, Barrett ML, Elixhauser A, Steiner CA. Patient Characteristics of Opioid-Related Inpatient Stays and Emergency Department Visits Nationally and by State, 2014. HCUP Statistical Brief #224. June 2017. Agency for Healthcare Research and Quality, Rockville, MD. www.hcup-us.ahrq.gov/reports/statbriefs/sb224-Patient-Characteristics-Opioid-Hospital-Stays-ED-Visits-by-State.pdf. Accessed February 13, 2018. 4 Weiss AJ, Bailey MK, O'Malley L, Barrett ML, Elixhauser A, Steiner CA. Patient Residence Characteristics of Opioid-Related Inpatient Stays and Emergency Department Visits Nationally and by State, 2014. HCUP Statistical Brief #226. July 2017. Agency for Healthcare Research and Quality, Rockville, MD. www.hcup-us.ahrq.gov/reports/statbriefs/sb226-Patient-Residence-Opioid-Hospital-Stays-ED-Visits-by-State.pdf. Accessed February 13, 2018. 5 Agency for Healthcare Research and Quality. HCUP Fast Stats Web site, Opioid-Related Hospital Use path. www.hcup-us.ahrq.gov/faststats/landing.jsp. Accessed February 13, 2018. 6 We used fiscal years (FYs) in this Statistical Brief because beginning FY 2016, on October 1, 2015, the United States transitioned from the ICD-9-CM clinical coding system to the ICD-10-CM/PCS clinical coding system. Although codes for opioid-related diagnoses are available in both coding systems, the change in coding systems resulted in a substantial shift in the number of opioid-related inpatient stays (ref. Heslin KC, Owens PL, Karaca Z, Barrett ML, Moore BJ, Elixhauser A. Trends in opioid-related inpatient stays shifted after the US transitioned to ICD-10-CM diagnosis coding in 2015. Medical Care. 2017;55(11):918-923). As a result, for comparability across years in this Statistical Brief, we used 2 FYs (2010 and 2015) with clinical coding entirely under the ICD-9-CM coding system. 7 Agency for Healthcare Research and Quality. HCUP Fast Stats Web site, Opioid-Related Hospital Use path. www.hcup-us.ahrq.gov/faststats/landing.jsp. Accessed January 26, 2017. 8 Compton WM, Jones CM, Baldwin GT. Relationship between nonmedical prescription-opioid use and heroin use. The New England Journal of Medicine. 2016;374:154-63. Supplementary Table 1. 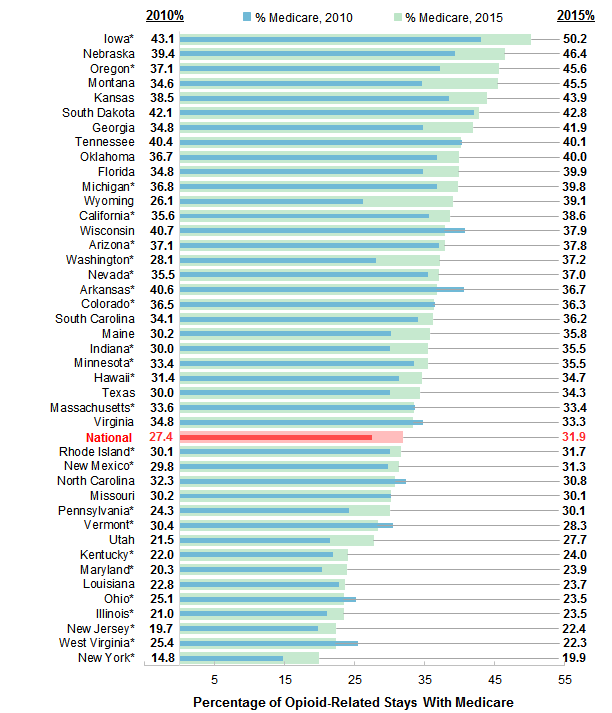 Percentage of opioid-related inpatient stays in each State by payer and year for data presented in Figures 2-5. Supplementary Table 2. Percentage of opioid-related emergency department visits in each State by payer and year for data presented in Figures 6-9. Internet Citation: Statistical Brief #239. Healthcare Cost and Utilization Project (HCUP). May 2018. Agency for Healthcare Research and Quality, Rockville, MD. www.hcup-us.ahrq.gov/reports/statbriefs/sb239-Opioid-Payer-Hospital-Stays-ED-Visits-by-State.jsp.